The global workflow automation and optimization software market is primarily dominated by multinational tech giants. The top five players account for well over half the share in the market and are constantly trying to outdo one another through product innovation. Driving growth in the global market for workflow automation and optimization software is the rising take-up of third platform technologies and soaring popularity of business process automation. Workflow automation and optimization software allows businesses to improve communication, reduce human errors, enable real-time reporting, and allow integration of third-party applications for added benefits. Such advantages are egging organizations to shift toward digitization of business processes. Cyber threats, however, are acting as a deterrent to the market for workflow automation and optimization software market. In order to tackle the menace, savvy players in the market are trying to develop more secure solutions. 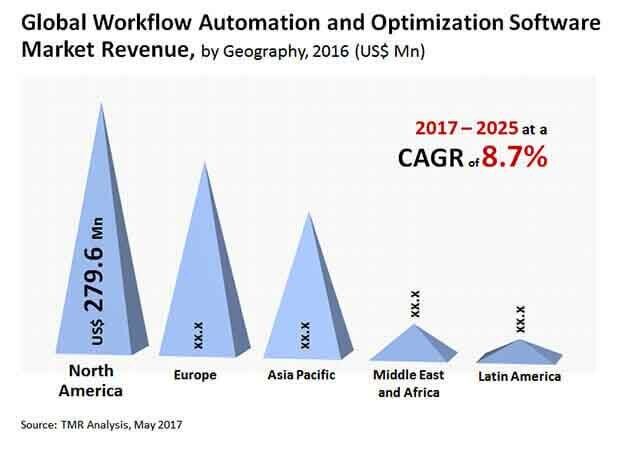 A report by Transparency Market Research forecasts the global market for workflow automation and optimization software to expand at a healthy CAGR of 8.7% from 2017 to 2025 to become worth US$1.456 bn by 2025 from US$0.713 bn in 2016. The global market for workflow automation and optimization software can be segmented depending upon end-use into education, banking, financial services, and insurance (BFSI), transportation and logistics, healthcare, manufacturing, retail, telecommunications and information technology (IT), etc. The BFSI sector, of them, held a dominant 21.8% share in the overall revenue in 2016. Expanding at a strong 8.3% CAGR between 2017 and 2025, the segment is expected to continue holding on to its dominant position. The primary reason behind it is banks increasingly leveraging enhanced fraud management solutions, mobile banking, smart automated teller machines (ATMs), etc. to offer better experience of their customers. In the years ahead too, the BFSI segment is predicted to retain its dominant position by holding 24.8% share in the market. In terms of growth rate, however, the education segment is expected to emerge as a winner by clocking a solid 9.5% CAGR between 2017 and 2025. Geography-wise, Europe, North America, Asia Pacific, South America, and the Middle East and Africa (MEA) are key regions in the global workflow automation and optimization software market. Among them, North America contributes the most to revenue because of massive automation of business processes in the region and also because of the copious number of vendors of workflow automation domiciled in the region. The North America market grossed a revenue of US$279.6 mn in 2016 and rising at a CAGR of 8.6% it will likely gross US$566 mn in 2025. Europe trails North America vis-à-vis revenue. Asia Pacific is another key region which is slated to outpace all others in terms of growth rate from 2017 to 2025. The growth in the region is expected to be brought about by the quick uptake of workflow automation and optimization software across different industry verticals. Currently, on-premise workflow automation and optimization software segment generates maximum revenue in the market in the region, but going forward, the cloud workflow automation and optimization software will likely expand at a greater pace owing to their rapid adoption by the healthcare, BFSI, and telecommunications sector. Prominent players operating in the global market for workflow automation and optimization software are Xerox Corporation, Oracle Corporation, International Business Machines Corporation, SAS Institute, Inc., SAP SE, OnviSource, Inc., Boston Software Systems, Flexera Software LLC, JDA Software Group, Inc., and Reva Solutions. Strategic study of the global workflow automation and optimization software market, and the growth forecast for the period 2017 to 2025, have been provided in this report. Under the scope of the report, competitive analysis of various market segments, based on deployment type, end-use, and in-depth cross-sectional scrutiny of the workflow automation and optimization software market across different regions, have been provided. Workflow automation and optimization software solutions are considered as a part of Business Process Management (BPM) solutions and aids in automation, optimization and streamlining of business workflows. Additionally, workflow automation and optimization software solutions aid in betterment of product and service consistency, faster decision making and increases productivity amongst various other advantages. The growing investment in third platform technologies and fast adoption of such technologies for business processes is the primary driver for the workflow automation and optimization software market. Additionally, the advantages offered by these software solutions have also been promoting the growth of the market. The market is also being driven by the increasing usage of cloud for business processes. The growing dependence on cloud systems, coupled with the demand for fast and efficient business processes, has been promoting the demand for cloud based workflow automation and optimization software solutions. In terms of deployment type, the global workflow automation and optimization software market is segmented into on-premise, cloud and mixed. On the basis of end-use, the market has been segmented into banking, financial services & insurance (BFSI), education, healthcare, manufacturing, retail, transportation & logistics, telecommunications & information technology (IT) and others. The market revenue for workflow automation and optimization software has been provided in terms of USD million, along with the CAGR for the forecast period from 2017 to 2025. In-depth analysis of the current trends in different regions including North America, Europe, Asia Pacific, South America and Middle East & Africa (MEA), under the regional market analysis present in the report. For supporting strategic decision-making, the report also includes competitive profiling of leading companies of workflow automation and optimization software market, their overview, SWOT analysis, different product and business segments, unique business strategies adopted by them, revenue garnered by the companies and their regional revenue share. The SWOT analysis, provided for each of the companies profiled, focuses on the strengths, weaknesses, opportunities and threats of the profiled companies, thus providing a enhanced understanding of the position of the major players in this market. The regional overview, provided in the report for each region, details the current trends of the workflow automation and optimization software market for the respective regions. The market attractiveness analysis, and competitive landscape included in the report provide insight into market dynamics, competition present in the industry and the most attractive segments in the workflow automation and optimization software market. The competitive landscape, provided in the report, allows for a better understanding of the major strategies undertaken by the industry leaders and their plans for a sustained growth in this industry. The report also provides specific assessment of the various factors impacting the global workflow automation and optimization software market’s growth, which are described as growth drivers, market restraints, and opportunities. These factors aid in pointing out the various existing and upcoming trends, coupled with their impact on market growth. Overall, considering the various factors affecting the workflow automation and optimization software market, the report includes a comprehensive analysis of the global workflow automation and optimization software market, and provides the anticipated growth for the forecast period 2017 to 2025. Some of the leading players in the market are Xerox Corporation (The U.S.), Oracle Corporation (The U.S.), International Business Machines Corporation (The U.S.), SAS Institute, Inc. (The U.S.), SAP SE (Germany), OnviSource, Inc. (The U.S.), Boston Software Systems (The U.S.), Flexera Software LLC (The U.S.), JDA Software Group, Inc. (The U.S.), and Reva Solutions (The U.S.) among others.